The end of my first week and so much is running around inside my head. Much of the time when arriving somewhere is sorting out who is who, what the most important parts of the project are, and what the next most urgent steps are. Looks like some improvements to the accounting system, and some teaching lessons for me might be order. 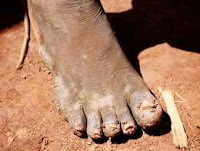 More on the project another day, as I want to share all about ‘jiggers’. These were a bit of a shock to me, but are in fact ‘sand fleas’ which live in dry dusty sandy areas in tropical areas. I’m now writing from the village of Belo, which sits in amongst the rolling green highlands of inland Cameroon, by the light of a flickering candle, using the last of my laptop battery before it, like me, falls asleep. There is a small project here working with orphans that I will be helping will for the coming little while. I’m taking over from an English guy, Niall, who has been here seven months and was very happy to get my email saying that I would be happy to try and help out as he leaves in a week. 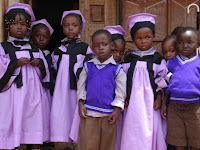 Today, as an introduction for me, we visited a local school for ‘graduation’ day, with two of the projects sponsored orphans dressed to the nines. It was a great way to get a feel for some of the issues presented with lack of resources and difficult conditions for children with little support, but also a celebration of life with singing and drumming from the school kids. After four weeks of various attempts, I tried a final time at the immigration office for an extension or conversion of my Cameroon visa but to no avail. It was time to put plan B into action so I grabbed my book and toothbrush and with plenty of time to spare (well, seven hours) before my visa expired, managed to get across the bridge separating Cameroon and Gabon hanging onto the back of a motorbike.